I'm here for my third and final conference for my fellowship program. I'm sitting on my patio doing e-mail rather than hiking or any of those other associated activities that I feel like I'm really supposed to enjoy but, beyond the sunshine, really don't. Because the Aspen airport is closed for repairs, we had to book flights to Denver and then drive. My flight left early Wednesday morning. I arranged Tuesday night for the cab to pick me up at 6:45, and, unlike my usual last-minute style, I packed most of my things the night before. I still set my alarm for 5:45, and when I woke up with the alarm I thought, "I probably can be ready in 20-30 minutes. What the hell am I going to do for an hour?" So, then, next thing I know I open my eyes again and the clock says 6:45 and there is a taxi honking outside. I sit up in bed, and for whatever reason I've got a nosebleed. So, then, I put on pants and run downstairs and outside shirtless holding my nose, to tell the cab driver to wait 5 minutes. (Me, going outside shirtless, I don't know if I've done that since high school, so you know we are talking desperate times.) I run to go back up to my apartment, and I realize I have locked myself out. And, yet, everything managed to work out okay and I was on my flight in time. Moreover, for those who wonder from my recounts of misadventures whether I am completely hopeless, my talk today seemed to go over really well. The longitudinal study that I've worked with closely the last few years is a sample of people who graduated from Wisconsin high schools in 1957. Since 1957+50=2007, this is the year these classes will have their 50th high school reunion, and the project offered to send a representative to speak at reunions that were willing to have one of us. Saturday night I drove to a certain small town in southwest Wisconsin to speak at their reunion. I invite you to reflect upon how much fun you would expect to have at a class reunion of a school you didn't attend, where you didn't know anyone (spouse attendees at least have their spouses), and in a community you've never been to before. And yet, I honestly had a very good time. Mainly because the place reminded me a lot of my hometown--only with a lot more community spirit than I ever saw in my hometown. I probably felt more comfortable and at-home there than at the average dinner party of professors I've attended. Everyone was also in such good spirits that it was infectious. The dinner started with a prayer; the reception started with the pledge of allegiance; and it ended with "God Bless America." I tried to remember when would have been the last time I said the pledge of allegiance. Sitting beside me at the reunion were these three wives of Class of '57 graduates. The conversation at dinner was sparse and awkward until I mentioned that I studied the Medicare prescription drug benefit, and then it became far more lively. The reunion was an all-class reunion, meaning any graduate was welcome. Different people spoke as members of different honor classes. A man from the class of 1947 (having their 60th reunion) told various stories from the good old days of their class, but one stood out. I didn't catch what it was, but there was some activity that the principal told the students he would shoot them if they did. The speaker and three other members of his class apparently did the activity, were caught, and were brought into the school. The principal pointed to one of the students and said "You first" and brought him back into his office. The speaker and his two friends were sitting there for a few minutes, and then there was this gunshot from inside the principal's office. The principal then stepped out with this smoking gun in hand. Of course, he revealed soon enough that it had just been blanks, but, said the speaker, "He still sure got his point across." The speaker said in concluding the anecdote, "Different times," as I was trying to imagine the CNN.com story that would be playing nationwide if a principal did this today. While other places have their signs that indicate the years they have won the "Best in Boston" distinction as voted in some local paper, Anton's Dry Cleaners in Somerville has a giant sign behind their count that annoys me every time I go in there: "Voted #1 Drycleaner! Everywhere, year after year." Yes, really--rather than rise to whatever occasion is needed to actually win whatever awards, they just have a sign up that simply asserts with no supporting evidence that they always win. When I'm in there I wonder why I would trust a place with my clothes when they so brazenly lie on a giant sign. But I needed to go in there today, because there is only one day between the trip to Madison I returned from last night and the trip to Aspen I embark on tomorrow, and Anton's is the only place advertising same day service if you get it in by 9 ("READY TODAY" in a sturdy, reliable looking font is what they advertise). I arrived there at 8:57. There was a line, though, and so by the time I got to the front it was 9:02. "It's after 9," the woman said. We can debate whether a place should honor their In-By-9 deal if you are inside the door by 9. However, "it's after 9" was actually just the second reason she gave for why my clothes wouldn't be ready, and she had told the people in front of me their clothes wouldn't be ready until tomorrow either. Her reason: "They won't get it back to us in time. We've had too many orders." I don't know what I'm going to do about my clothes. I am never going back to Anton's again, ever, considering they already charge high prices and now I realize their service advantage is "READY TODAY. MAYBE." Using cleaners in Cambridge has been so ridiculously poor in service and high in price compared to the In-By-10-Out-By-4-Always-Forever service in Madison. NEW YORK (CNNMoney.com) -- If you want to test drive a Toyota Camry or Honda Accord, starting next month you'll be able to do it at a Saturn dealership. General Motors is asking Saturn dealers to have one or more of the competing models in the showroom so customers can look at it, sit in it and drive it. "it is my oxygen--though i must also have regular oxygen"
One of my fellow fellows here just came in to show me the Shouts & Murmurs from the latest New Yorker, which is about the joys of conferences. It also includes what may be my favorite simile ever: "Insights dart and flash like the doomed fish in a whore's aquarium." If there is actually some lewd meaning to it, rather than just being resplendently weird, I don't want to know what it is. Sal is still $225 away from his goal with just a few days left. He keeps bringing up this idea of going to the mall with a bucket and a bell and wondering if he would get in trouble. Don't make Sal stand outside the mall ringing a bell! He's been training hard for this and deserves to have it come through. He's working on behalf of a good cause. If you can help, it would be absolutely wonderful. I wished I believed in karma so I could make you all sorts of promises about that. Don't make me pretend like I believe in karma! I'd rather stand outside the mall with a bell! Sal is the kind of guy who would give you a kidney if you needed one, provided you were a match and that he hadn't already given his spare kidney to someone else who reads this blog. Because of the kind of guy his is, he would still give you the kidney even if you didn't help him now, but really that's just another reasons why one ought to help him now. Thanks of course to everyone who has given so far. Again, the page to donate is here. To my knowledge, this is the only time I have ever engaged in any kind of fundraising on my blog--and there are no plans for JFW pledge week in the future--but I do think this is a great chance to help and do very much want to see Sal succeed because I know much energy and enthusiasm he's given to this. Update: Sal is good to go! Thank you so much to everyone who gave! I've agreed to stand at the starting line and begin running a half marathon on Sunday. Which is hilarious is many respects, at least until I'm out there running and wishing I had prepared more and whining, whining, whining. In any case, however uncertain I am about my own fitness, I'm still sure I could trounce my original running partner right now if she hadn't been too chicken to enter. Bwawk! Bwawk! BTW, be sure to congratulate Kieran if you haven't. I would like to express my EXTREME DIS-Satisfaction with the grade you gave me. To the point I almsot take it as a personal insult. I look over the individual grades you gave me for each project and I cannot understand why it all added up to a virtual "D". And then attendence and participation... "D" This I don't understand. I was ALWAYS participating in critiques.. That's one of the things I know about myself, I like to express my opinion on subjects and give ways of makeing them better. And I DISTINCTLY remember myself participating throught the semester. PLUS -- According to you, you told me I was abscent a total of 3 times with 2 latnesses. Does that really qualitify me for a "D"? Again, I really think that grade is wrong. Then we come to your written comments which I find particularly disturbing. "frequently abscent or late" Again, 2 lateness and 3 abscenes in 5 months means "frequent"? "disrespectful, disruptive" Okay. This I find almost insulting. There ONLY time you thought I was being distrespectful was when I made a joke about you being "brainwashed" it's not like I made a joke about your Mother or something. I don't understand why you felt the need to even put that down. And disruptive? When was I disruptive? I like to joke around a lot. Have a good time. Have fun. Throught the sememser I don't remember myself acting up at all. Unless your opinion of what "being disrpitive" is, is different from mine, which is probably quite the case. So in conclusion, I'm not sure why you felt I deserved such a kick in the balls with this grade, but I am deeply saddened that after all the work and money I spend on supplies and building these projects, a virtual D is what I get in the end. I Really REALLY stress you rethink this grade. I appologise if there was something about me you didn't like, but if you talk to any professors who have had me, they will all say I've been a pleasure. The previous email that I sent to you was written after I just learned what grade I will be receiving for the semester. It was written in haste and I was very upset and disappointed. Unfortunately, I hit "send" before I had time to calm down and review the letter. Now that I have, I regret some of the things that I wrote and am writing again to you now to apologize. I want you to know that I enjoyed your class very much and learned quite a bit that I'm sure will help me in the future. Although I was hoping to achieve a better grade, I realize that I should have worked harder to earn it. Perhaps I am more disappointed in myself than the grade that I earned. Thank you for an enjoyable and informative semester. It's unclear to me if the same person wrote the second e-mail, or if his girlfriend or Mom stepped in for an intervention. crap. i was worried this might happen. I find myself, with only about two months left living in Cambridge, a Red Sox fan. 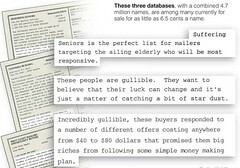 If you are worried that you are having too good of a day today and feeling too upbeat about the world, be sure to read this story in the NYT about the mass-marketing of phone lists of vulnerable seniors. Judging by the mail laying around when I go back to the farm, my father is totally on the "Gullible Senior Adults" lists. My father has also been nearly deaf for the last twenty-five or so years as a result of all the noise in the meatpacking plant where he worked, a situation that has been modestly (but still miraculously) improved in recent years by cochlear implants. I can be become very sad very quickly if I think about all that my father has missed out on by not being able to hear. So now I'm sitting here feeling horrible because my first thought as I was reading this story was that maybe it's not all bad that my father cannot use the phone. I'm still really excited to be going to Northwestern and all, but I have to admit my enthusiasm was a teensy bit diminished when Eszter announced that it would NOT be okay if Sal and I moved into the condo next door, put on our matching robot pajamas, had perhaps a little too much to drink, and sledgehammered our way through her/our wall to create a Super Social Science Wired Hipster Thirtysomething Mega Compound/Mothership. I hate when friends are unreasonable. Sal, possessor of one of the finest souls on this planet, needs about $500. He agreed to raise $2500 for the AIDS LifeCycle ride he has been training madly for, and he's $500 short with a week to go. I am not here going to make some telethon-like statement of the good works done by the folks at AIDS Lifecycle, but information can be found from the links from Sal's donation page, which is here. So, give some money for people living with HIV/AIDS. If the goodness of that deed is not enough to convince you to give, then give some money for Sal, who has been working very hard both getting ready for this and in doing fundraising. ** And if that is also somehow not enough, do it for me and for yourself, because Sal is totally going to owe me one if a substantial dent in his $500 is made from contributions resulting from this post, and I will be sure to collect on this in some way that will provide entertaining fodder on this blog when we are both living in Evanston. Promise. Again, the page to donate is here. Give. I won't ask you to give until it hurts, but do give until it stings a bit. Give until it smarts. * Something I've always wondered: all these people were giving George Bailey all the savings they squirreled away, but then the Hee-Haw guy telegrams and says he can basically advance George all the money he needs. What happens then? Do the friends take back the money? I know I would. "George, you know I totally had your back, but you don't need my nestegg now that you've got Hee-Haw Guy ponying up money he won't even miss." ** Including, if you look at his messages of support, convincing me to give twice, so my money is where my mouth is here. nonremarkable feats of saloon proving! This involved firing up some rather long dormant mental machinery and saying "uhhh" for protracted periods, thus being unable to concentrate on rooting for the Suns and thereby possibly contributing to their loss. But, to a level of astonishment that even caused the game to pause and Amare Stoudemire to look through the screen at me and say "Whoa! ", I did it! "So, if the square root of two was a fraction, it would be equal to x/y where both x and y would be integers." "That would mean that the square of x was twice the square of y." "So what I need to do is prove that a number that is twice the square of an integer can't be the square of another integer." "Well, any integer can be expressed as its prime factors, and the prime factors of the square of an integer are just going to be those prime factors twice. So the square of an integer always has an even number of prime factors"
"Twice the square of an integer has to have an odd number of prime factors. Because its prime factors are going to be the prime factors of the square of the integer--an even number--and two." "If twice the square of an integer has an odd number of prime factors, then it isn't itself the square of any integer. So there are no integers x and y for which the square of x is twice the square of y. Q-E-[expletive deleted]-D."
you can take the boy out of the midwest, but you can't... wait, can you even really keep the boy out of the midwest? I recently hit Send on one of the most terrifying e-mails I have ever sent in my life: one in which I tell my chair at the University of Wisconson-Madison that I will be resigning my position there. Wisconsin, in case you are somehow unaware, is a wonderful place to be a professor, and Wisconsin Sociology is in particular a special place if you are a sociologist. True enough, one is extremely fortunate to be able to choose the greater of multiple goods rather than the lesser of multiple evils. Believe me, I regard myself as a truly ludicrously lucky human being. Even so, the particular act of saying no to futures one believes would likely be fabulous still seems to me a good deal more daunting than saying no to futures one is not enthusiastic about. In any case, clicking Send on these e-mails was certainly some of the most trepidly-taken mouse clicks of my life. I said no to these alternatives because I said yes to another one about which I am extremely excited. This fall, I will begin serving as a Professor in the Department of Sociology at Northwestern University. So after sending the declinations, I was able to follow by clicking Send on a very enthusiastic acceptance. Northwestern is a great university with great people in a great place to live, and the area also features some cherished social ties. I am not going to say anything here about particular reasons for selecting Northwestern over other possibilities. Except: I want to emphasize that I leave Madison with no complaints, and with much gratitude for the generosity and faith I have been consistently shown by people there. Trust me: Madison is special. I'm not sure exactly when I'm moving. I have come to be firmly of the belief that if you decide your future is somewhere, you don't want to dally in getting yourself to that where. I'm not always great at following my firm abstract beliefs, though. My lease here in Cambridge is up August 1. For people keeping track of my Big Ten Tally, the count will be five: Iowa, Indiana, Michigan**, Wisconsin, Northwestern. Deliberating about all this over the past few months has been the most cognitively exhausting episode of my life. Part of my celebrating having it done with was to change my signature file quote to the official motto of the state of Wisconsin: Forward! * I know common thinking in situations like this is that if you make a choice and it doesn't work out, you can always later pursue being able to reconsider taking up a future more along a path you'd foregone. Which may be broadly true but is not strictly true in that you don't get the time back and, as they say, you only get one life. ** Yes, Michigan counts. I collected a paycheck from there, had an e-mail address that strangely still forwards me spam, taught students for credit, and have ultimately spent 24 weeks of my life (in different capacities over four summers) there as part of the ICPSR Stats Camp. Story on an NYT blog today about a woman in the Netherlands who may be serving a life sentence because of an error in statistical reasoning and an example of sampling on the dependent variable. [S]uppose that police pick up a suspect and match his or her DNA to evidence collected at a crime scene. Suppose that the likelihood of a match, purely by chance, is only 1 in 10,000. Is this also the chance that they are innocent? It’s easy to make this leap, but you shouldn’t. Here’s why. Suppose the city in which the person lives has 500,000 adult inhabitants. Given the 1 in 10,000 likelihood of a random DNA match, you’d expect that about 50 people in the city would have DNA that also matches the sample. So the suspect is only 1 of 50 people who could have been at the crime scene. Based on the DNA evidence only, the person is almost certainly innocent, not certainly guilty. The error is that if the police had picked the person up as a suspect completely at random and found that their DNA had a 1 in 10,000 match to that found at the scene of the crime, then, yes, the person is most likely innocent. But, police tend to pick up suspects for nonrandom reasons, and the more the nonrandom reason is related to the actual probability that the person is the culprit, the less relevant the 1 in 50 calculation is and the more relevant the 1 in 10,000 probability is. Because there isn't a neat way of synthesizing this into a new probability estimate, people jump from one bad way of reasoning about the problem to another bad way of reasoning about the problem. "Oh, Teletubbies, I haven't thought about them in ages. I wonder if they're still on TV?" 10-point Arial? No indentations or other indication where paragraphs start other than that the preceding line is shorter? Seemingly not quite double spaced? No way! So, I succeeded in staying offline for twelve hours. When I finally logged in, less than three minutes after time was up, it felt a little bit like coming up for air. What I did is I took my phone, my laptop, and the Internet cable for my desktop, and I locked them in the drawer of my filing cabinet. Then I took the key to the filing cabinet and stood on a chair to place it on the top of this high shelf in my office. Then I moved the chair to the opposite side of the room. I understand it would be better if I could just say to myself "Sasha*, stay off the Internet," and have that be sufficient for me stop misusing this device I must use for my work that also happens to be the most wondrous distraction device ever created in the history of man. Instead I must assemble more elaborately engineered strategies for self-restraint. Whatever, it worked. The actual experience of being off the Internet has been quite pleasant, which may seem weird to say considering the whole problem is my compulsion to be on the Internet. The impetus for this has been a deadline for a paper I'm massively behind on, which is stressful, and yet it's also felt strangely a little like a vacation. Aside from quelling the compulsive checking itself, it also keeps my cognitive space from being colonized by any crises or other developments that can trampoline from my inbox into my brain at any moment if I'm continually monitoring e-mail. I'm not sure what tomorrow's plan will be. Someone in the comments of the last post mentioned the problem that it's hard to work on the references part of a paper if one is not online. This is correct, and part of what I need to work on the references part. I do want to schedule in one long offline stretch though. * Apparently Beyonce also refers to her special self as "Sasha." One more point of evidence for the theory that she and I and Sarah Vowell are soulmates. I unplugged my computer from the network and went twelve consecutive hours yesterday without checking my e-mail or otherwise using the Internet, whether from that computer, my laptop, or my phone. Sure, I've gone twelve hours without checking my e-mail various times recently, but yesterday was twelve hours in which I actually spent most of the time working on a computer. Superhuman (or, at least, superjeremian) will and essentially constant supervision from Sara was involved. I'm going to try the same thing today. I've taken care of my e-mails for today and resolved there is nothing that could arrive in my inbox that needs to be dealt with today (or, at least, nothing that has given me fair warning that it could arrive and need to be dealt with today). I feel like I'm taking a last lungful of breath before plunging myself underwater for some David-Blaine-like feat of human endurance. As regular readers of this blog know, I am seeking more broadly to combat some of my more compulsive tendencies regarding the Internet. Plus I have to get a draft of this paper I'm working on done. So, world, root for me. I will let you know if I succeed or, if I fail, the gory details of my lapse of will. i just had a brilliant idea! Brilliant, I tell you! I wish it was a brilliant substantive idea. Instead, it's just a gimmicky idea for this talk I have to give. Still, I'll take what I can get on the brilliance front. I know this blog [sic] is terribly old but this story got brought up today and I did a google search for evidence because no one belived me. My brother was a coroner in Alameda County CA (the county that Oakland is in) and dog gonnit there WERE twins with these names. My brother picked one of them up one cold night in the coroner van. I CONFIRM LEMONJELLO AND ORANGELLO! The post in question describes how the book Freakonomics mentions African-American twins named Orangejello and Lemonjello (pronounced o-RANJ-el-o and le-MOHN-je-lo), how I was deeply skeptical that twins with these names actually existed outside urban legend, how I was surprised to look in the back of Freakonomics and see that the source credited for the story was the sociologist Doug McAdam (who is said to have met the twins in a grocery store), how I was even more surprised when I e-mailed McAdam and he vouched for the anecdote, and how various cursory efforts of mine to use sources online to verify the existence of the twins had proven fruitless, although I could find other people who had made other claims about the existence of these twins in other places and other times. Naturally, the person who left the above comment didn't have an e-mail attached to his blogger profile so I can ask for verification from his coroner brother. If I were independently wealthy, I think I would just offer a reward to anyone who could provide me verifiable evidence of the existence of these twins, sort of the way people who are skeptical of the supernatural claims have a reward for anyone who can produce verifiable evidence of supernatural abilities. "I think he's a good student. I had three graduate students this semester who were really into the idea of doing carnal sociology. Of them, he was the one who actually took the time to read the book." Note: The carnal sociology website is down but promises to come back "Bigger. Better. Faster." but not, strangely, "Carnaler." What are the most important things for sociology graduate students to do during their tenure in graduate school? 1. Figure out what kind of career they want. 2. Develop the substantive expertise and other skills that will allow them to be effective and prosperous in that career. 3. Develop the credentials that will allow them to get a post-Ph.D. job consistent with career they want. Update: Somebody e-mailed to ask, "Why would you end a post with 'Thoughts?' and then turn off comments?" I'm not sure why comments were disabled but now they are enabled. So, um, somebody comment. Will people in Iraq even get the metaphor? There was a time in my life when somebody saying "it's game time!" meant the class was going outside for recess. Welcome to Sociology at Wisconsin. That period is going to bother me every time I look at it. Why not just omit the period? Or, if one does feel like treating the headline as a sentence, why not use an exclamation point? Update, soon afterward: One should be sure not to make annoying typos in a message whining about somebody else's punctuation. friends, you can stop forwarding me the links to this story. i've read it. Yes, I am interested in genetics. Yes, my diet has recently fallen by the wayside. Yes, I plan on getting back on the diet wagon, regardless of whatever my genes say. No, probably not today. I might be more forlorn if I thought my problem was that I had a slower metabolism, and so my body would inch upward even when I ate a reasonable number of calories. Instead, my problem is that I seem to want to eat more food than other people--and, for that matter, almost all other large mammals--do. The appetite may well have genetic origins, but it provides more hope for intervention. "You're really mean in how you talk about [name]." "I'm not mean! You should see how nice I am when I am talking to him." "What would you do if you could travel in time like David Blaine?" "I would probably procrastinate more, but with less negative consequences. Other than looking much older than I supposedly am." "Don't you worry that your professional credibility is undermined by having a blog where you put this personal information about yourself online?" "I used to worry a lot about it. But I'm an empiricist, and my blog has had numerous opportunities to manifest observable negative professional consequences and it hasn't happened yet. Besides, I don't blog anything especially personal, and things that might undermine credibility I often refer to obliquely or like I'm talking about someone else, not me." "I am totally discouraged and desolate about this paper I'm working on right now. I feel like I have gone from trying to spin a silk purse out of a sow's ear to feeling like I am trying to spin a silk purse out of a imaginary sow's ear. I must persevere with this, I know, but I must also take away lessons." BTW: Happy birthday JECG, if you read this. Amaranthine. Re: I am ready to kill myself and eat my dog, if medicine prices here are bad. Setting aside the matter of the extremity of this prospective reaction to bad medicine prices, who waits until after their suicide to eat their dog? Ways to get me to proofread a paper even when I don't have time to do so: misspell my name and "proofread" in the request. 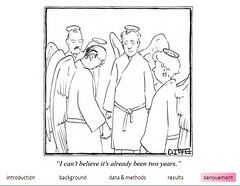 i guess maybe he really is an angel after all. but what kind of angel?! I have already told the story about my family and David Blaine on this blog. I've been trying for the last several minutes to upload this video from YouTube, but there's some problem at the YouTube-Blogger interface. (Don't be surprised if ten posts of it suddenly show up here.) In any case, it is absolutely hilarious, so click over and watch. Sorry my blogthusiasm has been flagging lately. Much is going on. Note to friends who know about the main ongoing distraction in my life: still no resolution, but hopefully soon. I have not restarted my diet as I promised. Now that everyone seems to have read Getting Things Done, perhaps someone could direct me to its prequel, Getting Things Started. A difference between Dan Myers and me: Dan, whenever he needs a little pick-me-up, apparently drops and does 20 push-ups. Me, I've taken to brightening my day by idly listening to the vegemite jingle over and over. Taking a long time to make a decision doesn't necessarily mean that a person is indecisive; it could be that the decision in question is genuinely hard. Via Tom B, a new contender for my favorite actual completion of the title "The Social Construction of X": The Social Construction of Time for Mars, by two of the principals on the astrosociology frontier. I sure hope a certain graduate student doesn't try to use connections to apply for any sociology faculty positions on Mars. When I was at the National Science Foundation, the meeting was interrupted by the building-wide announcement that rumors that a gunman had been loose in one of its buildings had been shown to be unfounded, and were the result of someone mishearing "fire alarm" as "firearm." I am not making this up. The announcement went on for a few minutes, describing some preliminary "lessons learned" from the incident, and promised a follow-up report that would be distributed throughout the foundation. I am here to attend a workshop associated with the National Science Foundation. When I get back, I have this paper that is overdue and really must be done, which is not even to mention the other paper that is overdue and really must be done. Also, however, I am publicly saying as a matter of committment via this blog that I will need to restart my diet. I was doing well but not really so much tracking, but the last few days have seen that fall more by the wayside through a combination of certain unblogged stressors and traveling. I should insert something wry or hilarious here, I suppose, but I'm tired. Oh, and: When I checked into my hotel, the clerk got this strange smile as he was looking at the screen while checking me in and said, "Because you are the 100th customer of the day, I'm going to upgrade you to the club floor." I thought he was joking, but then I was, indeed, upgraded to the club floor. Would Hilton really be having something where they were upgrading the 100th customer, or is it more likely that they upgraded me for some other, possibly random reason and he was just joking/dissembling about why?